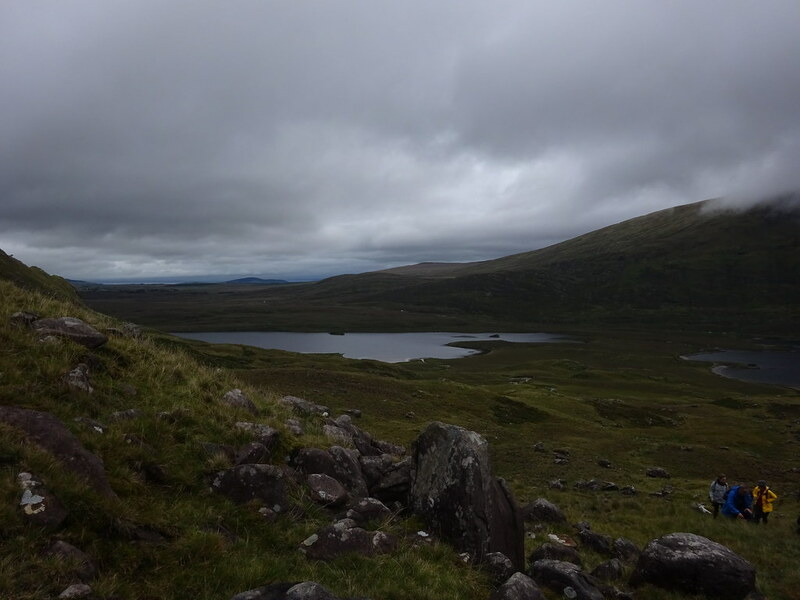 A trip up Mweelrea, the highest point in Connacht and one of Ireland’s most dramatic mountains, with Tommy McGibney. 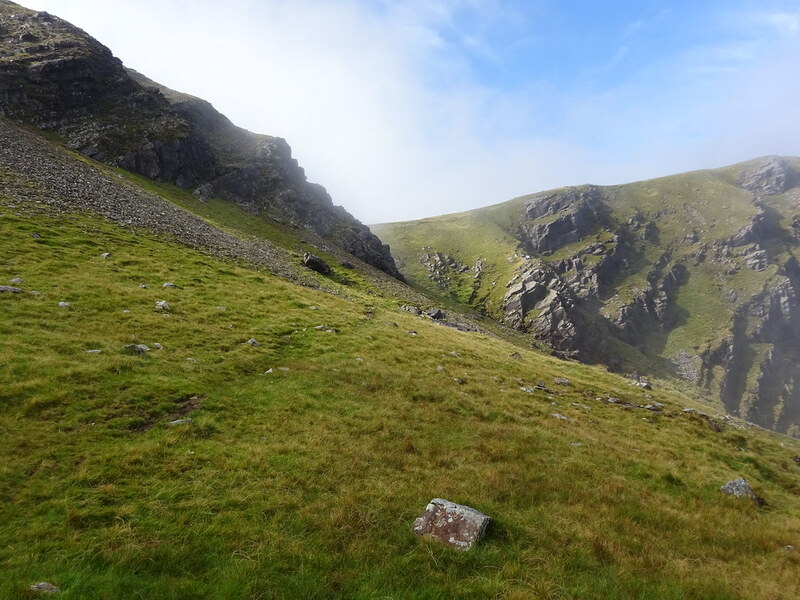 Last month I had the privilege of climbing one of Ireland’s greatest mountains, Mweelrea, at 814m the highest point in both County Mayo and also the province of Connacht. This was my second visit to Mweelrea, having first scaled it on a damp summer day in 2014. This time I did it as part of a group organised and led by Russell Mills of MountainTrails.ie. 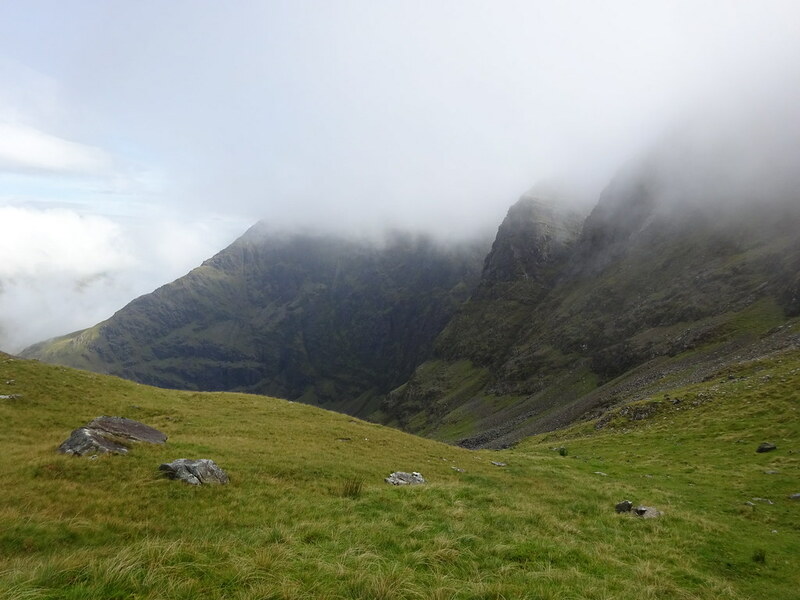 We walked from the Doolough valley via the “ramp” up Ben Bury and towards the summit and back again by the same route. We started early on a moody morning with the upper reaches of the mountain shrouded in cloud. The route we took first involved a walk through a boggy area between two lakes and a short ascent into a corrie, with a sharp climb after that onto the mountain of Ben Bury. This is the famous (or infamous) ramp, by any measure a tough rise up a grassy slope, surrounded by magnificent cliffs and crags. 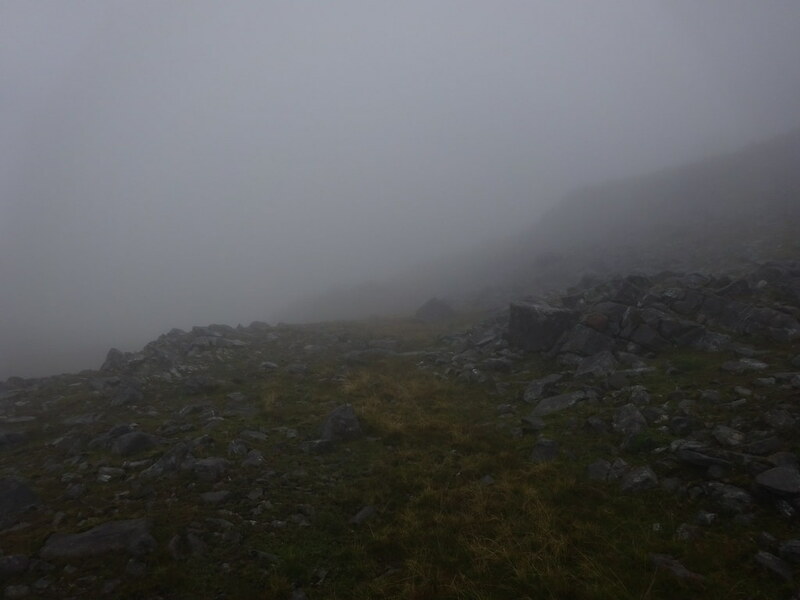 The clouds were descending and visibility gradually worsening as we made our way up the ramp. I found the going reasonable but was glad of the frequent rest breaks. As we climbed I was dreading the top of the ramp where there is a short exposed track with a precipitious drop into the valley below, but I found this less daunting than expected. 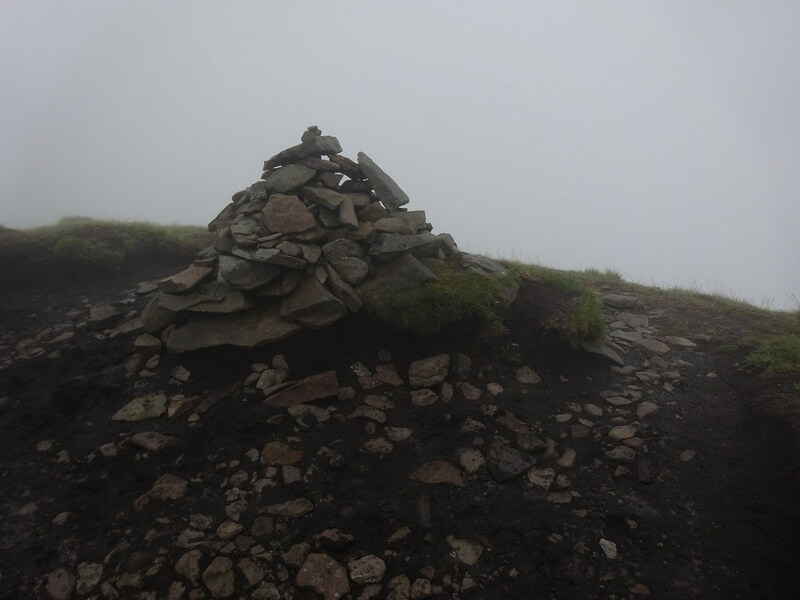 Once onto the open mountainside on Ben Bury, we passed a cairn marking the end of the ramp proper and we proceeded quite a distance in the thick cloud over mostly pathless ground. 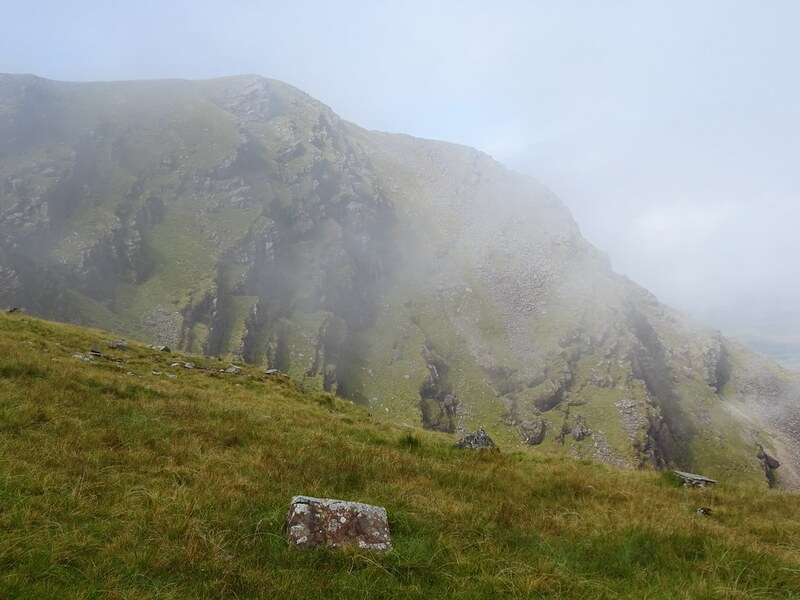 The cloud meant that we couldn’t really see any faraway views but the visibility was still good enough for us to make comfortable progress towards the col between Ben Bury and Mweelrea itself. There we stopped for a bite to eat as the cloud thickened and turned to drizzly rain. Our progress from there up towards the summit was relatively straightforward and not nearly as steep as the ramp had been earlier. 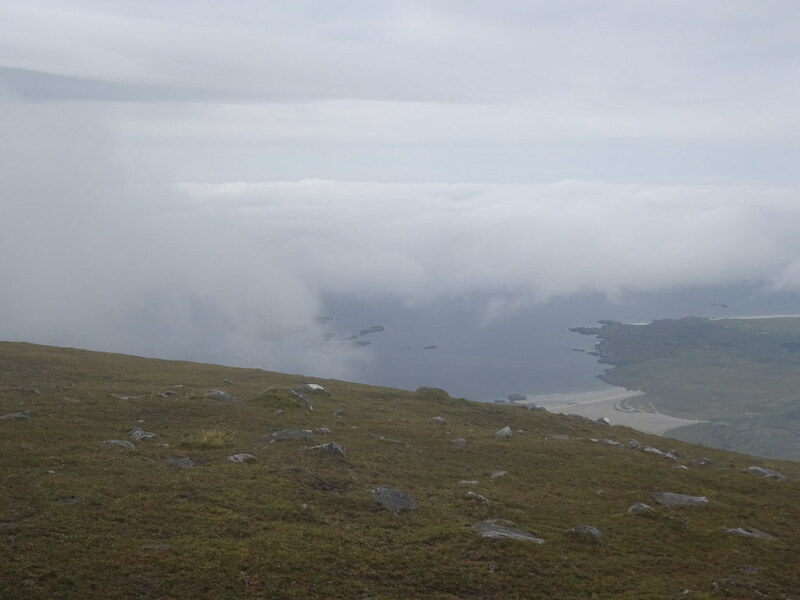 It was a relief to reach the summit, although again the cloud meant that we couldn’t enjoy the famous views high over Killary Harbour and the Atlantic Ocean. 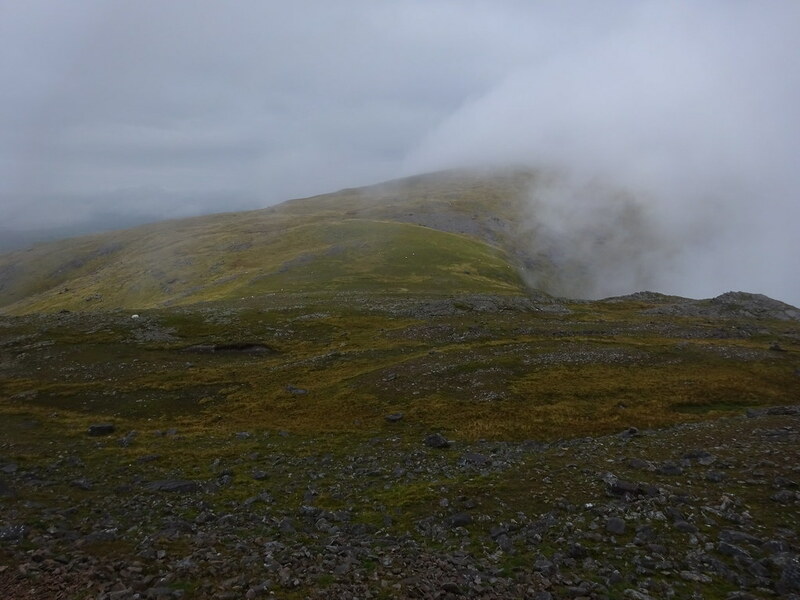 As we left the summit, the clouds ahead of us briefly cleared, offering tantalising views to the north. The views continued to improve as we returned towards the col with Ben Bury, where we had earlier rested and eaten in almost total gloom. From here we made good speed towards the ramp and safely negotiated passed the perilous point at its top. From here the journey down was breathtaking. As the cloud lifted, the sun shone and the glorious cliffs and crags all around revealed themselves in all their majesty. It made for an enchanting descent, although the steep gradient meant that every step warranted care. If anything the views improved as we descended and soon we found ourselves in the corrie we had passed through early on the walk. 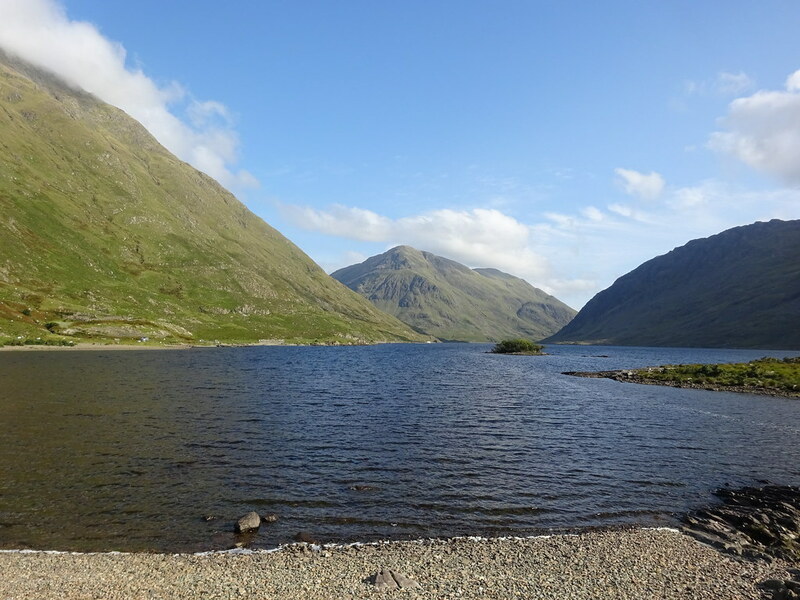 From there it was a pleasant walk back to our starting point with the beautiful Doolough lake and Ben Gorm resplendent to our right. Having started at 9.45 that morning, it was 7 hours later when we returned to our cars just before 5pm. Mweelrea is an epic mountain, in my view one of the finest and most dramatic in the country. It’s also a demanding mountain though, requiring considerable physical effort and good navigational skills. If you’re up to it, I highly recommend it. Sounds like a great day was had. We would love to return to it on a good clear day ourselves bit I guess they are rare. Like you, we only had views on our way down when we done it. Indeed it was, Patrick. Mweelrea of all places is somewhere where good timing pays off. On this occasion, I was part of a group walk so I didn’t have to worry about navigation and the particular hazards that this mountain brings, but had we set off a few hours later we would probably have enjoyed great scenery at the summit only to be under pressure for daylight on the descent.